MASPETH, NY — The topic of “allied products” has been discussed at length from the earliest days of the coffee service industry more than half a century ago. A few OCS operators have defined their role as “a general services department for small businesses.” But few have taken that concept as far as The Weeks Lerman Group, a family-owned company that has grown by merging compatible businesses into a one-stop shop for a wide range of business needs. Steve Lentini, WLG’s director of office coffee services and janitorial supplies, explained that Weeks Lerman offers its clients not only office, breakroom and janitorial supplies, office furniture and advertising specialty items, but also a variety of managed services, from printing through office design and space planning to technology support – and, of course, office refreshments. Not only does this broad spectrum meet the growing demand for “single-sourcing,” but the company follows through by working to maximize the economies that can result from meeting many customer requirements billed on a single invoice. The company has long experience in recognizing (even anticipating) its clients’ needs. Lentini, who had served as a facilities-supply consultant to WLG, came aboard full-time in February to manage its growing beverage services program. He reported that this unit now represents about 25% of the firm’s business. It offers brand-name coffee blends and roast colors from well-known national roasters – Starbucks, Peet’s Coffee & Tea, Dunkin Donut and Maxwell House – as well as local favorites like Brooklyn’s own Stone Street Coffee and For Five Coffee Roasters in Queens County. Also available is a broad spectrum of sophisticated conventional coffee brewing and espresso equipment and systems from Gevalia, Keurig, Mars Beverages, Jura, de Jong Duke, Lavazza, Nespresso, Bunn and others. The company also has icemakers and a full line of commercial kitchen appliances available for lease. An extensive range of alternative hot beverages, from leaf and herbal teas to hot chocolates, along with creamers, sweeteners and stir-sticks, rounds out the line. Lentini noted that, unlike most office product suppliers, Weeks Lerman employs on-call technicians to keep the equipment in good working order. The company also can deliver a wide variety of packaged cold drinks, for which there is great demand in today’s offices. As the demand for pure water has increased, WLG has added point-of-use water treatment systems. It also has an agreement with bulk bottled-water distributor ReadyRefresh to deliver water to clients that require an unplumbed dispenser and bill it through WLG, so the account retains the benefits of the single invoice. And it has devoted considerable attention to making it as quick and easy as possible for its customers to place orders online. A recent addition to the Weeks Lerman office refreshments menu is the Lavit chilled water dispenser, a countertop machine that delivers filtered still or sparkling water. The Lavit machine also accepts novel single-serve 100% recyclable aluminum “EcoCap” cartridges to produce still or sparkling drinks, available in a wide variety of contemporary flavors with the patron’s preferred level of carbonation. Lavit beverages contain no or low sugar and are preservative-free. The naturally-flavored drinks provide 10 calories or less. The dispenser prepares and serves a cold drink in 12 to 15 seconds. Lavit’s aluminum beverage capsules are 100% recyclable (they can go right into the recycling container) and are produced with one-seventh as much aluminum as a 12-fl.oz. can.The system underwent five years of extensive testing before its introduction at the end of 2015, and well over 1,000 now are on location. Weeks Lerman has begun deploying Lavit machines in its metropolitan New York City market, and now has a substantial number of them in the field. The Lavit water cooler features a touchscreen user interface and accommodates a filtration system for point-of-use treatment of municipal water when plumbed into the client’s water supply. It also can work with bulk water bottles by use of a pump. The dispenser accommodates a 1.5-lb. CO2 cylinder, which will carbonate approximately 400 12-fl.oz. drinks. The machine runs on 115 VAC, 60-Hz. power, drawing 2A. (230W.) Its patented preparation system mixes the drink in the single-serve aluminum capsule, so there is no cross-contamination. It incorporates an SIP Technologies ozone disinfection system for daily sanitation. The coffee service industry has a long history of introducing attractive but unfamiliar new technology by conducting on-site demonstrations. These worked well with small-batch pourover brewers in the 1960s, and continue to work well for the latest single-cup capsule and pod machines. Lentini reported that the Lavit system is very well suited to this selling method. All of Weeks Lerman’s delivery vehicles carry a cart that can accommodate a Lavit dispenser or other equipment plus a 5-gal. water bottle and pump, to speed and simplify demonstrations. He has found that the demo is especially interesting to clients who presently order cold beverages in cans and bottles by the case, which are heavy and take up much more storage-space than the Lavit cartridges. This is an advantage to the operator too, both in the warehouse and on the route: 144 packaged drinks occupy about four cu.ft. of space and weigh 120 lbs. ; 144 Lavit “Ecocaps” take up .75 cu.ft. and weigh 1.5 lbs. And there is no lack of variety. Lavit launched with an extensive line of flavors ranging from contemporary formulations of such classics as root beer and spicy ginger ale to on-trend specialty fruit drinks like açai pomegranate. Since its debut, the line has been expanded with the addition of four AriZona Beverages tea-based selections. Coming soon are two items developed with Juice Press, based on its popular Rose Water and a new functional energy offering, Cinnamon Guarana Water. The Lavit line has found favor with WLG’s clients. “The Lavit system is a strong revenue generator and offers good per-machine profitability,” Lentini explained. While it isn’t for clients who count every penny – but neither are upscale espresso machines – the Lavit dispenser has won wide acceptance. Another recent addition for Weeks Lerman is cold brew coffee, both Nescafé concentrate and cold brew in pressurized kegs from a local roaster. In today’s full-employment economy, the competition for employees is fierce, and it has become more challenging to retain them. Lentini told VT that the company’s customers increasingly are making use of its extensive office design capabilities to change the layout of their workplaces so they are more open and better-suited to collaboration and the exchange of ideas. He added that demand also is growing for “pantry” installations, at which free snacks and beverages are available. He sees an opportunity for adapting micromarkets to this sort of breakroom replacement; the client could issue market cards or other payment media to employees. The cardholders would receive an agreed-upon value for daily employer-paid free refreshments; the employee would have the option of purchasing additional products if that value were exceeded. More and more employers recognize the strategic value of providing a generous assortment of free beverages and snacks at work. 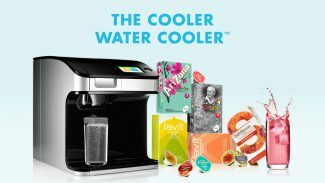 Products like cold-brew coffee and Lavit’s distinctive water/cold drink system appeal strongly to the growing cohort of millennial job-seekers, and are fit well with Weeks Lerman’s client-focused operation. This entry was posted on Wednesday, April 4th, 2018 at 1:21 pm	and is filed under News.